RV Air Conditioners - all you need to know when selecting your new cooling system, be it roof mounted, or under-bench, with heat-pump or heat-strip or without…. Air Conditioning system became one of crucial elements determining the comfort of life. For most of us the “sauna” is a conscious choice for dozen of minutes, but definitely no one would like to live and sleep in hot and humid environment. And this is especially true when we are on our summer’s RV-vacations and want to enjoy the opportunity of being out. Let’s start with basics: The cooling capacity of an Air Conditioner unit is traditionally expressed in BTUs/h (British Thermal Units per hour). Do not try to understand the meaning, just keep in mind that higher the BTU number, the AC can lower temperature and remove moisture faster. To some extent the feeling of warm-cold is relative (it’s an individual experience), so when selecting the AC just follow the guidelines for the RV you own (size and thermal insulation), the climate zone and eventually your own preferences. Obviously you need some BTU margin to make the cooling process fast but keep in mind – “bigger” is not always better and usually comes with some restrictions and obviously price. In practice the choice of cooling power is simple – the most popular units on the market are 13,500 BTU (13.5k BTU) and correspondingly 15,000 BTU (15k BTU). If you can live with less, you will find also smaller units rated at 6-to-9k BTU. If you need more than that ,you will end-up with two or three units! In practice you may assume that for the RV longer than 25 ft you may need the 2nd AC unit. Typical 15k BTU AC needs about 15-16 Amps to run (more during start). It fits into the power budget of 30A service still leaving some for other electrical loads (microwave, fridge, small appliances, TV, lights etc..). RVs with two ACs will definitely need 50A service. If the power cable connecting RV to the grid is long, at higher loads you will experience a noticeable voltage drop (for example the nominal 115V may drop below 105V at the AC input). This may “disturb” operation of some appliances, may make them less efficient and if voltage drops even farther, it can lead to their failure! When selecting new AC unit look for high-efficiency one (they may run at around 12A only). It will not only have lower operating cost, but it will also leave you more power for eventually 2nd and/or 3rd AC unit. There is no point to remind that “lite” is a king. Any extra (and unnecessary) pound of load will reduce your cargo capacity, increase fuel consumption and eventually exceed the towing capacity (if already marginal). So when selecting your AC unit look at the best of few worlds meaning: comfortably-sufficient BTUs, required mounting place/space, cooling efficiency, required electrical power, size, weight and obviously the price! (here written in a random order). Pop-up tent campers are not really designed for interior “climate control”. The main reason is lack of any thermal insulation (canvas), so the cooling and heating efficiency is very low and the effect does not last long. However, if someone really wants this luxury, then probably a PAC (Portable AC) unit will be if not the best than at least “good-enough” solution. But we will not address here in details this solution. 2. While proper BTU rating, efficiency and price are of concern when it comes to residential AC systems, the size, weight, profile, mounting place etc… are not so much. That is why for RV-ers these parameters define an “uncharted territory”. Ford 220RB Travel Trailer with roof-mounted 13.5k BTU ducted Air Conditioner. As you can see it is barely visible thanks to its "ultra-low" profile. Modern low-profile roof-mounted AC units especially designed for RVs represent superior choice. They come in two “flavors” – ducted (cold air is distributed through vent-pipes and then ceiling or floor registers) and non-ducted (air is blown directly from the AC unit through the “distribution box”. The ducted Air Conditioning systems are usually quietest ones. What also helps to lower the level of “inconvenience” is the fact that AC’s main “engine” (compressor and fan) can be located farther from the crucial living and sleeping areas. The specially designed AC systems (like for example “QuietZone”) can actually reduce the noise to “whispering”! And this is exactly what you want from the good RV AC unit (“cooling down the temperature without being noticed). Indeed, the ducted AC units are not visible inside what improves interior’s aesthetics. After all, you would like to keep the residential charm, elegance and stylishness when on the road. Ducted QuiteZone AC system is a combination of the “Quite AC” and an air distribution system. The latter must be installed in the factory so you have to make this decision (if such option is available) at the time of ordering your RV. 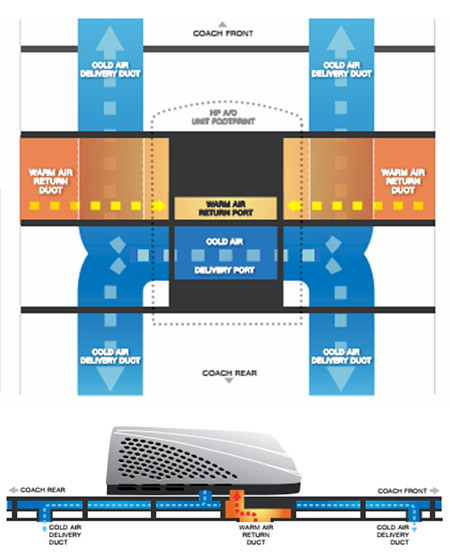 Ducted AC system can distribute the cold air more uniformly than the non-ducted one thanks to placement of registers in “strategic” locations. Like in your home – ducted ACs are controlled from wall-mounted thermostat (or as a sign of time – using your cell-phone with application). Non-ducted AC systems are noisier and definitely “more intrusive”. First of all, they have to be located in crucial areas (bedroom, living space …) so you will be directly exposed to the noise. And they are more intrusive, because the cold air has to be distributed by stronger blowers from the central position all over the RV. There is no free lunch, so roof-mounted AC has also some drawbacks. The main one is that the condenser’s coil will be mostly exposed to the sun (unless you can park your RV in the shade). This will reduce AC efficiency (possibly you may not be able to lower the interior temperature as much as you wish) and certainly it will increase energy consumption (it means $). When selecting the roof-mounted AC, its low profile is crucial for at least two reasons. First, you want to have low aerodynamic drag when on the road (fuel efficiency = $). But equally important may be the increased height of your RV (clearance). If you plan to park it (and store for “out of the season”) under the sky, then it may not be the most important factor, however if it may fit into your garage, then every extra inch counts. Under-bench AC units are popular solution for small RVs (travel trailers). It’s because small RVs are either not designed for installation of roof AC or their clearance is an important factor. Note that big rigs will be rarely stored in the garage, but small ones may and every inch of extra height will cause problems. BTW - under-bench “concept” includes also AC units installed in storage compartment (the name underlines the fact that the AC unit is placed at the floor level). It is inferior solution to roof-mounted low profile AC but sometimes you may not have much choice. While you do not affect your clearance, you will definitely lose the storage space (either compartment or an under-bench one). And I guess it is needles to repeat here that storage space is always one of the critical parameters, especially in small RVs. Dual use systems (AC/ Heater) may be a logical choice when you plan RV-ing over extended seasons (and/or in “colder” climate zones) when the heating may be necessary. RV industry proposes two “integrated” solutions: AC/Thermo-Pump or AC/Heater. Their main advantage of such solutions is the level of integration. It is just one unit (so takes less of the precious space). The combo AC/Heat-Pump is probably the best solution. In simple words it is a “reversible” AC that can pump the heat from inside-out (cooling mode) or from “outside-in” (heating mode). This also means that the heat-pump (also known as thermo-pump) is an integral part of the AC and cannot be bought as an “add-on” (attachment). Understandably AC/Heat-pump systems are more expensive. The benefit of the AC/Heat-Pump system comes from the fact that within the exterior temperature range up from about 40 degF the heat-pump has higher efficiency that any traditional electric heater. However if the exterior temperature is too cold, it takes too much of effort (read it – energy) to bring-in hot air. The “red line” is crossed when the amount of energy used by heat-pump to heat the space is higher than energy you will use to heat the same space by the traditional (resistance) electric heater. Practically speaking the AC/Thermo-Pump unit it is an elegant solution during chilly spring or autumn seasons (temperatures in low 40’s), but not for the winter. The combo AC/Heater is a combination of two independent modules: traditional Air Conditioner and Heat Strip (typical resistive heating element). Basically the only common element of this tandem is the fan (blows the cold or hot air), ducts (if any) and electrical connections. It should be noted however, that typically Heat-Strips have low power and so they are only good to warm up the RV when outside temperatures are in 50’s and up (that is why they are sometimes called “chill-chasers”). And this is the temperature range where the heat pump is definitely superior. Because the Heat-Strip is an independent element it can be installed as an option whenever available (this is in contrast to the Heat-Pump). 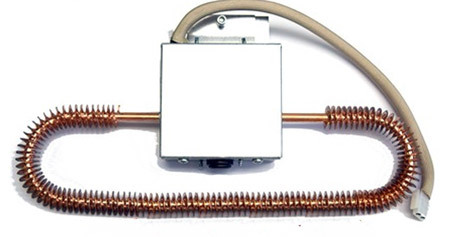 Heat-Pump (or Heat Strip) is not the right solution for the winter. In temperatures close to 32 degF and below, you definitely need the high BTU-rated (at least 30k) gas-furnace to make your RV “habitable”. Fortunately in chilling temperatures it simply does not matter that much. All you want is a bit warmer and less humid air. Note that an under-bench A/C unit (also popular solution in smaller RVs) with its vent located next to the floor is also not optimally placed for cooling. You may experience “frosty” temperatures at the floor level and much warmer close to the ceiling. In contrast, it will be good position for heating with AC/Heat-pump (or Hear-Strip) system. Well, it’s difficult to have the best of two worlds. Unless you have a Four-Seasons RV, majority of recreational vehicles are designed for summer vacations. That is why they should be optimized for cooling rather than heating. The Heat-Pump (or Heat Strip) is the bonus that may help to extend RV-ing time from the Spring till Autumn. And frankly AC/Heat-Pump (and to lesser extent Heat Strip) will definitely do this job. Obviously fan(s) (air blowers) can mix the air quite efficiently, but once again there is a limit of how much you would like to live in a “windy” environment. Fine, quasi-natural air flow (convection) is the friendliest way of distributing the warm or cold air. Quality of AC’s installation matters so even a good AC unit may cause headaches. Note that the camper’s shell may act as the “Resonance Box” amplifying compressor’s and/or fan’s vibrations (so familiar effect to owners of windows units). So far all practical AC systems ran on an electric energy. And let’s face it – unless you can be connected to the grid or you have a generator with right power rating, using your AC to bring the comfort-in will be a dream. The required amount of electrical power cannot be delivered from auxiliary batteries (they will be depleted in a matter of minutes). It also cannot be provided by solar power (unless you haul behind your RV the Solar Farm). There are plenty of generators on the market (most runs on gasoline, some on LPG), but once again, they are quite noisy. If they do not “kill” you, they may prompt neighbor(s) to take an action you may not like! Heating systems do not have these limitations as traditionally they operate on propane gas. In other words having the gas furnace you can be much more energy independent (almost all petrol stations sell LPG) and enjoy RV-ing over the whole year (provided you have 4-season RV). But they need an extra space, add the weight (so limit the cargo capacity) and are not free! Typically the maintenance of AC units is limited to cleaning the air filters. This should be done periodically and it is not only mater of accumulated dust, but also of germs, bacteria etc. It is also advised to check the exterior coil vents for debris, leaves, and any damage that may obstruct the air flow (especially important for roof-mounted ACs). The circulation system of refrigerant is sealed and should not need any recharging during its lifetime (unless is damaged or simply speaking you have “bad luck”). Similarly the electrical motors are sealed and do not need lubrication. Summarizing: Armed with this knowledge we hope you can make the educated choice when selecting the AC unit for your RV. After all, the fresh, cool air from the AC system you can’t even hear is a key to fantastic RV-ing experience. 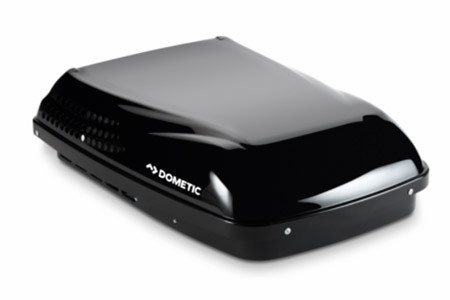 Dometic is a manufacturer of roof, split and under-bench air-conditioners. Brisk II series: The next generation of rooftop heat pump climate control units that acts as both cooling air conditioner and as heater, stronger, lighter, smaller and more environmentally friendly than its predecessors. The series includes models rated 13.5k BTU and 15k BTU, some only ACs, some with Heat-Strip and some with Heat-pumps. Brisk II models are designed for ducted and non-ducted systems. Pinguin II series: Low profile air conditioners, for both duct and non-duct applications (air distribution box available separately). With an ultra-low profile, the streamlined rooftop unit is aerodynamically designed to reduce drag when on the move. 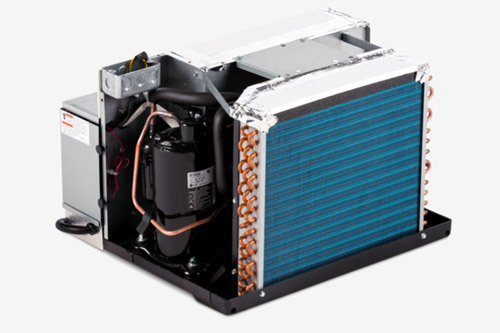 They come rated at 13.5k BTU and 15kBTU (heat-pump versions are available). Cool Cat – Small footprint AC/Heat pump units for under-bench or storage mounting with rating of 10.5k BTU. Rooftop models AC135 and AC150 (rated correspondingly at 16k BTU and 18k BTU. According to manufacturer these are light, very efficient and quietest on the market units. The 18k BTU one comes with the Heat-Pump. Unfortunately the profile is not the lowest one! Manufacturer of split Air Conditioners.